A rash of missing persons in New York City leads investigators to the discovery of subterranean mutants that have been eating humans. It turns out, the government has also been trying to cover it up. 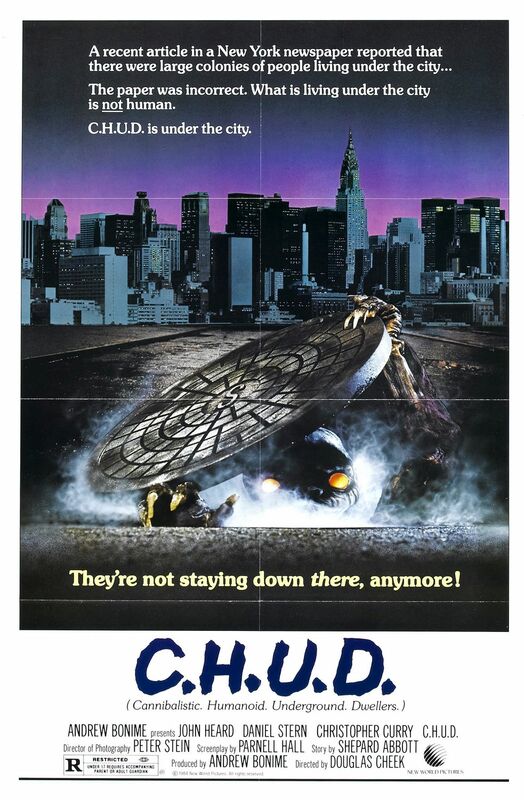 "C.H.U.D" is a low budget 80's schlock horror film directed by Douglas Cheek. This is the only feature film he has ever directed, and after watching it, it's totally understandable why he never made another movie. It stars John Heard who plays George Cooper, a photographer working on a project photographing the homeless in New York City. The homeless of the city are the primary victims in this flick. Daniel Stern plays A.J. 'The Reverend' Sheperd who also works with the vanishing homeless through his soup kitchen. Finally, Christopher Curry plays police Captain Bosch whose wife has recently disappeared. These three individuals investigate these strange disappearances and soon discover the existence of C.H.U.D.s, or Cannibalistic Humanoid Underground Dwellers. The further they investigate, the most it appears that the government has made every attempt to cover up their existence. Let's rip the band-aid off quickly, shall we? "C.H.U.D." is not a good movie. There are some elements, however, that are actually decent. The creatures themselves look really good considering the movie's low budget. There are a couple moments of intense gore, especially during a scene involving a gaping wound on a man's leg. It's disgusting and cool all at the same time. The film also deals with themes of government disregard for public safety and their lack of concern for the poor, as well as rampant corporations and the fears and threats of nuclear mutation. These were all prominent social issues in the 80's, a decade dominated by commercialism, corporate expansion, and fear of nuclear power and toxic waste. Unfortunately, "C.H.U.D." doesn't build the necessary tension to explore these weighty issues and takes a while to really get going. Because of this, it winds up being very boring for most of its runtime. There are also not enough C.H.U.D.s in "C.H.U.D.," which sort of defeats the purpose of making it a horror flick. When it boils down to it, this movie is more about the men who inadvertently created the creatures and tried to cover them up with little regard for human life. Those are the real monsters rather than the C.H.U.D.s. themselves. It is just too bad the overall themes were not better explored and the story wasn't better executed. What we are left with is a poorly paced mess instead of something scary and/or insightful.